We have all seen her leap in the year behind her teammates but do you remember her as an individual gymnast? I wrote about her along time ago here: https://ludafenka-en.blogspot.com/2011/01/beautiful-young-gymnast-from-bulgaria.html. At first I was skeptical about her move to the group. 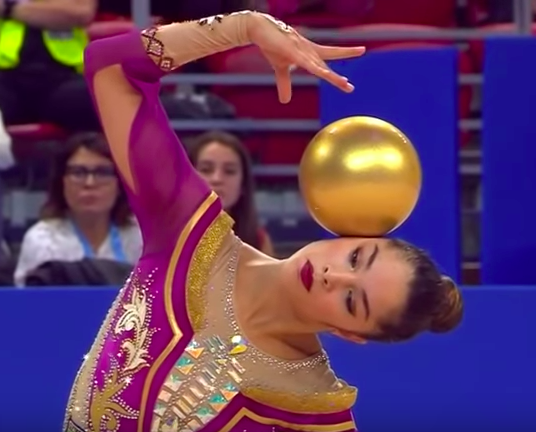 This is a gymnast who always adds her own interpretation to every movement and, with those touches, can make a routine memorable, but groups are about uniformity and harmony, not rock-star individual stage presence. I thought she would stand out with her own style and not look like the other four girls, to put it simply. Now that she has been with the group for a while, I think her place as leader of the group has made a significant impact on the entire national team, an impact she may not have had the chance to make before. She raises everyone's spirit and pushes for a more expressive style. I think the others on the team perform more boldly under her guidance and contagious example. Being part of the group exercise does not work smoothly for everyone and many top performers retire due to the internal politics of their federation because they don't "break through" as an individual competitor, or at least not as quickly as their coaches expect. The group is not some kind of second chance, though; it is simply a different challenge and a choice to commit and contribute to a shared goal. While Simona had a lot of potential to bring her gymnastics to the next level as an individual as she's a true actress and a diva of dance and expression, all the personal sacrifices she has made to be part of the group are definitely well worth it. She has become the leading athlete in a dream team and is participating in performances that will leave a mark on the history of the sport. This spring at the World Cup in Sofia, the Bulgarian group has made everyone rise on their feet and jump with joy and pride. Both of their routines have been amazing, but especially the clubs and hoop routine. The Bulgarian group also replaced Eli Bineva with the former individual competitor Erika Zafirova and it handled this challenge gracefully. As the group won the all around gold and despite some mistakes in the finals, it truly dazzled. Last year the group began its journey to writing history in the sport of rhythmic gymnastics with a ground-breaking, high-speed 5-hoop routine, which showcased a lot of risk and a musical interpretation from another level. This year, both the 5-ball routine and the mixed routine have risen to the same level. I just can't help but wish that the individuals attempted a complex choreography of the same scale and effort. Unfortunately, although Boryana Kaleyn's routines have some original and wonderfully choreographed parts, these routines are not there yet. As for the Vladinova and Taseva routines, I have felt that they just don't "shine" this season. While the gymnasts are not in top form yet, I think many fans expected that Taseva and Vladinova will both truly represent the Bulgarian style. A style and choreography that makes you say: wow, this is different. Not this season, but perhaps soon, as Kaleyn matures into the exciting gymnast and superb athlete she can become. This is an original, difficult, and provocative routine where everything from the choice of leotard to do risky tosses and the harmony with the music works together into a memorable performance. Set, set, clear sun, go dark. And you, clear moon, set, drown. You cry or your leaves, and I cry for my youth. My youth, forest sister, won’t come back. Alexandra's work and her evocative performance definitely reinforce the hidden meaning we can read into these lyrics which is: our days on Earth are counted, so make all the risky moves you can make, go into all the jumps and turns, and throw yourself into life. 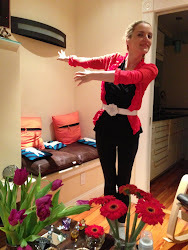 For everyone who watched Alexandra's coach, Spela Dragas, who literally jumped with joy after the score came out, I think the lesson about being joyful and enjoying life has come through very clearly.